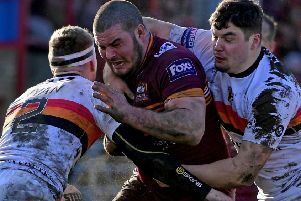 Batley Bulldogs produced a spirited performance as they went down 34-12 to Betfred Championship favourites Toronto Wolfpack at rain lashed Craven Park last Sunday. The Bulldogs were staring a heavy defeat in the face as they trailed 28-6 at half-time after the Wolfpack ran in six tries including four in a quickfire 13 minute blast. 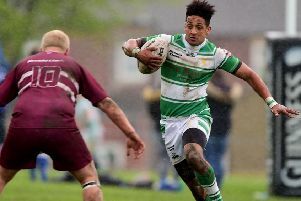 However, a combination of improved defence and a torrential downpour which made handling extremely difficult, meant Batley only conceded one more try after the break. Toronto were looking to bounce back from a shock defeat against Toulouse the previous week and took the lead after just four minutes. A penalty put the Wolfpack on attack and Gadwin Springer drove the ball in before play was switched left for former Hull FC winger Matty Russell to dive in at the corner but it was too wide out for Gareth O’Brien to convert in the swirling wind. Batley were forced to defend three consecutive sets close to their line and they were finally unlocked when a short pass sent Andrew Dixon over next to the posts and O’Brien converted. Batley hit back in the 14th minute as Dane Manning — back in the side after missing the defeat to Bradford the previous week — produced a storming run through the Wolfpack defence and he found Dave Scott in support to send the full back racing over for a try which he improved. Batley had another chance when Manning and Louis Jouffret linked but they were penalised for obstruction. Then came a four-try blast which saw the Wolfpack take control. A swift counter attack ended with Josh McCrone’s kick being gathered by Jack Logon to score his first try of the season. Toronto then moved play left on the last tackle and Ricky Leutele collected the ball one handed and dived in at the corner but O’Brien’s conversion struck the post. Russell collected Jon Wilkin’s long pass to cross for his second try in the corner, but O’Brien was again off target with the conversion. Leutele intercepted a pass with Batley in a good attacking position and he raced away for his second try, with Ryan Brierley taking over the kicking duties to convert and ensure the Wolfpack headed into half-time with a 28-6 lead. Russell looked to have completed his hat-trick early in the second half but was judged to have stepped into touch on his way to the line. Toronto did add a seventh try through Wilkin, which O’Brien converted but that proved to be their final score. Batley’s efforts were rewarded with a second try when Manning chased Oliver Russell’s kick and flicked the ball back just before it rolled dead and Jouffret was alert to touch down, with Scott converting. As conditions worsened, handling became increasingly difficult and the game petered out with no further score.